This is a short post to let you know Dare to be healthy is changing its name to Rock on Divas. Rock on Divas is a health and wellness website focused on women who want to live healthy and heal from treatment. The blog name change is necessary to avoid any confusion. All my awesome followers via the blogs or email will be transferred over to the my new blog Rock on Divas. The content will remain the same which means you still get my awesome food and juice recipes and other health articles I write about. If you do not wish to keep following, please let me know by posting comments to this article. If you do wish to keep receiving my posts, and I hope you do, you have absolutely nothing to do except sit back and wait for more fabulous posts to drop into your mailbox! Thanks so much for sticking with my blog and I hope you’ve enjoyed my posts so far. Stay tuned for more to come! For those who want to look and feel younger, here’s one to try out. Packed full of vitamins, minerals and very high in antioxidants to chase down those free radicals running riot in your body trying to age you. Blitz all in your blender and start winning the war against the radicals! The weather is so awesome right now especially to have ice cream. Ever thought about making your own healthy ice cream? Try this recipe out, it’s so yummy and you don’t even need to add any sweetener. The fruit sugar sweetens it enough – though if it’s not enough for you, you could add 1 tbsp. of agave nectar or sweetener of your choice. 4. Blend until smooth or if using a vitamix, it will form four mounds in the jug – it’s ready. 5. Enjoy straight away or empty into tupaware and freeze. I like to sprinkle chopped almonds over it, love the crunch! In this wonderful weather, we need something that’s cooling and refreshing especially for those who don’t like to drink water. Use any fruits you like to achieve the flavour you want. Make sure you thoroughly wash the fruits before chopping the into chunks. 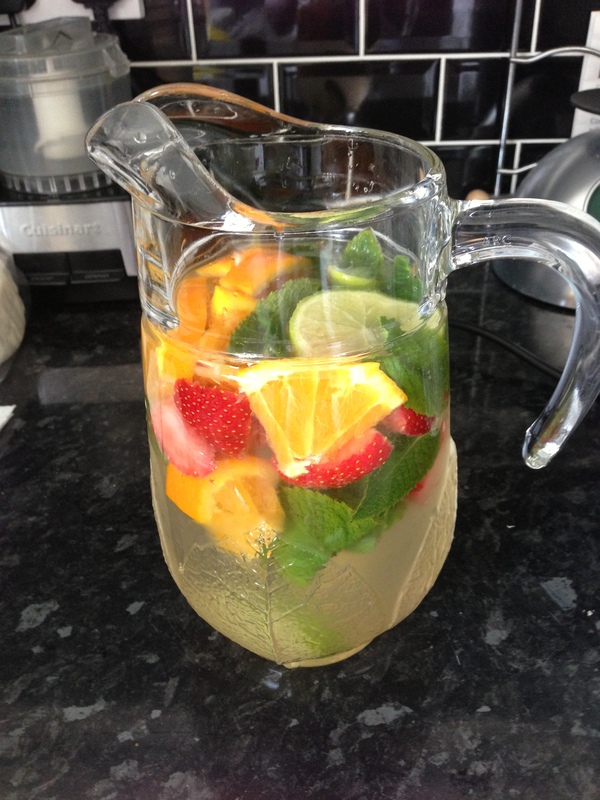 Squeeze one chunk of orange and like into the jar and put all the fruits and mint in, add the ice and pour water in. Enjoy! 3. Add milk, oil and eggs to dry ingredients. 4. Mix well, pour batter in hot skillet (I use a little bit of oil spray, so it won’t stick) until surface is bubbly, flip to cook the other side. Place all ingredients in a small sauce pan, add a drop of water and cook until sauce begins to thicken, about 10-15 minutes. 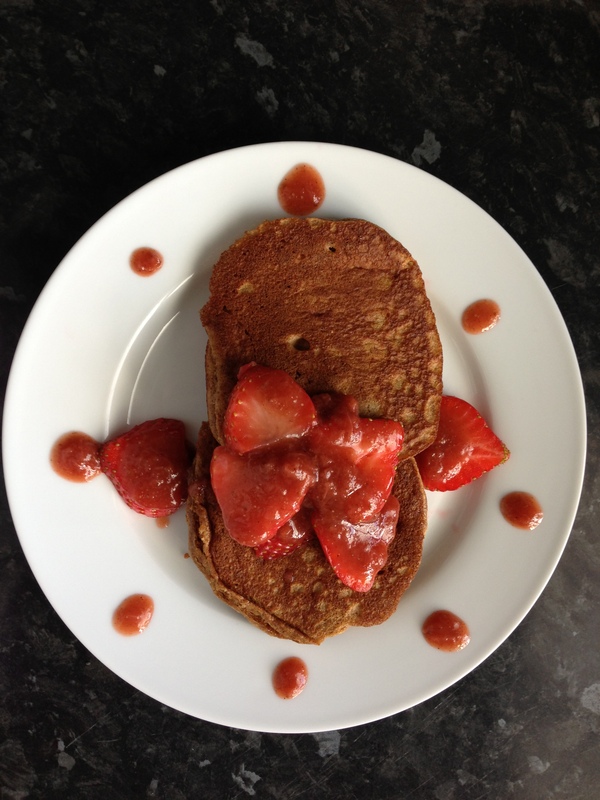 Place pancakes on a plate, top with strawberries and sauce, enjoy!